"Ocean View Beach House" is a 4 bedroom, 3 Bathroom unit, sleeping 8 in total. It has been awarded 3 stars from the Tourism Grading Council and is located in Palm Beach on the KZN South Coast. Und ... "Wir sprechen Deutsch". 2 of the bedrooms are en-suite- one with a king size bed the other with 2 single beds. The other 2 rooms that share the third bathroom have either a king size bed or 2 single beds. There is a living area upstairs and downstairs, with DSTv Easyview included, Premium Channels can be arranged at an additional charge. There is a large balcony upstairs with views that will take your breath away! We are located next to the Mpenjati Nature Reserve (South Africa's second largest wetland), and you will be a mere 100m from the beach! The 1800 sq m garden has a patio with a braai in front of the house, and has an abundance of bird life, that we try to preserve the peace for- Unfortunately no pets allowed. Enjoy a warm winter or relaxing summer holiday in a modern, secure and privately owned house, surrounded by a beautiful garden with a gorgeous sea view. The house is linked to 24 hour armed response and has 1 garage with ample additional parking. 2 living areas- upstairs and downstairs. One garage with ample additional parking. 1800 sq m garden, ideal for bird watching. Close to Several Internationally Renowned Golf Courses. Low Season: Remainder of the year. Children are regarded as persons, babies excluded. 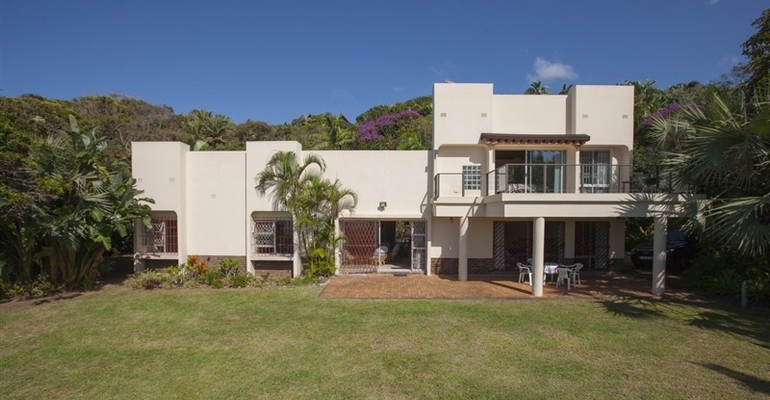 Close to San Lameer, Southbroom & Wild Coast Sun Golf Courses, to name but a few internationally renowned venues. There are two hiking trails in the nearby Reserve, with bush buck and a pair of blue duikers in the forest and whistling ducks on the lagoon, which is suitable for fishing, windsurfing and sailing. There is also a variety of bird species, both in the reserve and on the property, for keen bird watchers. During the winter months watch the world famous “sardine run” from the balcony of Ocean View Beach House.The sardine run occurs from May to July when billions of sardine move northward along the east coast of South Africa. Their large numbers create a feeding frenzy amongst dolphins and gannets along the Palm Beach coastline. The shoals are often more than 7 km long, 1.5 km wide and are clearly visible on the surface from spotter planes, and from our balcony. Customer Review: Thank you for leasing your lovely house to us. We made some good memories. My sister travelled from New Zealand, my brother from Cape Town, and my husband and I from Phalaborwa. As my parents are in their late eighties, it was very special to all be together again. Palm beach is the perfect place to walk, talk and relax, and the whales playing offshore were an added bonus.